While sitting out in the yard last week, we noticed a butterfly flitting around a few plants at the edge of the woods, a flight pattern that usually indicates it is a female looking for a place to lay an egg. The butterfly was an Eastern tiger swallowtail, so we knew she was looking for either a tulip poplar or a wild cherry, the two common host plants in these woods. She finally landed on a tulip poplar leaf, paused for a couple of seconds, and flew off. Melissa ran over to look, and after searching for a minute, found an egg. 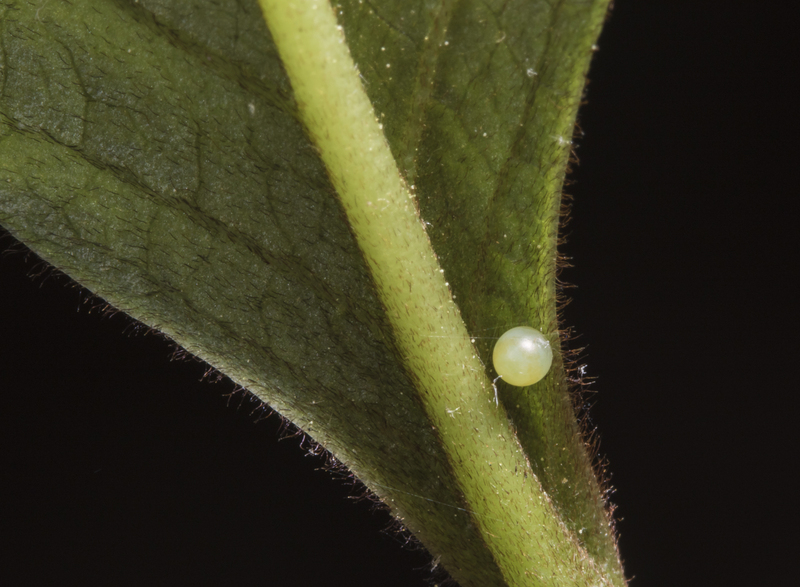 Finding butterfly eggs can be relatively easy if you find a female butterfly hovering near her host plants. They usually flit around, twisting and turning, as if searching for something (which they are). They may land on a leaf for a second, “tasting” the leaf with chemoreceptors in their “feet”, to see if this plant is the right one. If not, they move on. If it is, then she may curl her abdomen and linger for a second, attaching an egg in the process. 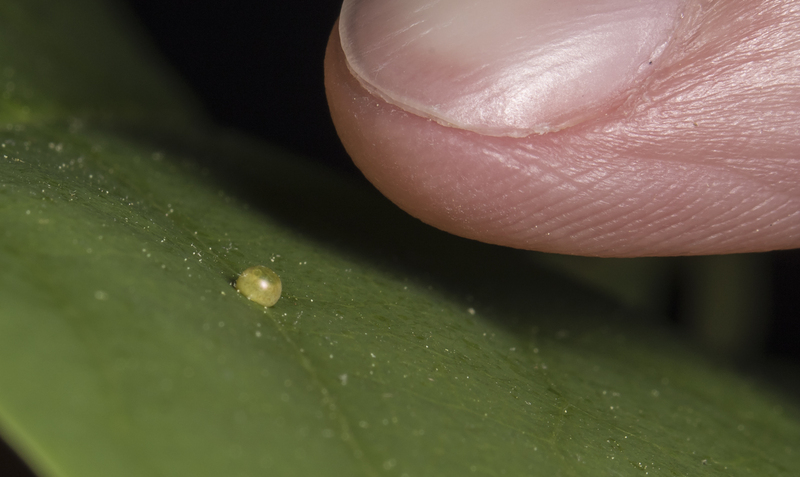 The female secretes an adhesive substance to secure the egg to the leaf. Eastern tiger swallowtails lay a greenish egg that blends very well with the leaf surface, making it tough to spot. The past few days I searched a few more tulip poplar saplings at the edge of the yard and came up with a couple of more eggs. 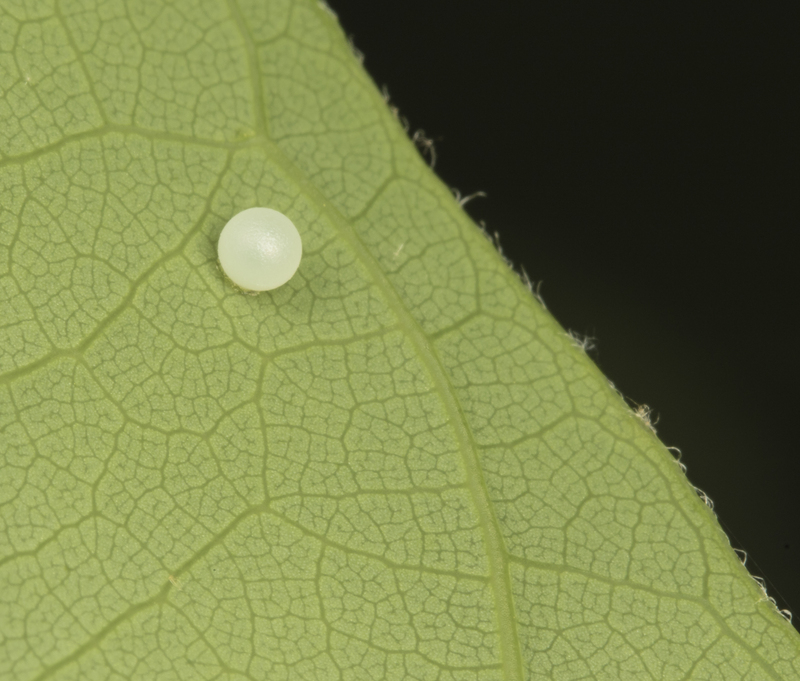 Can you see the swallowtail egg on this leaf? 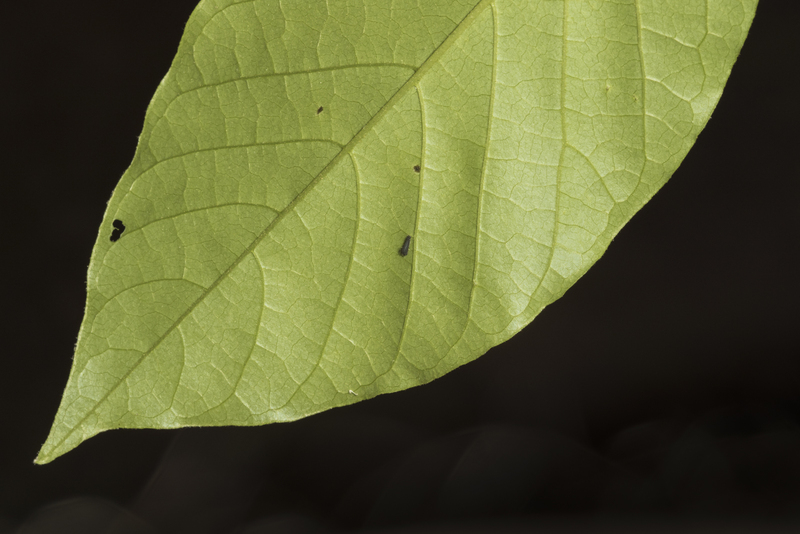 Hint…click on the image to enlarge…it is on the right side of the leaf. 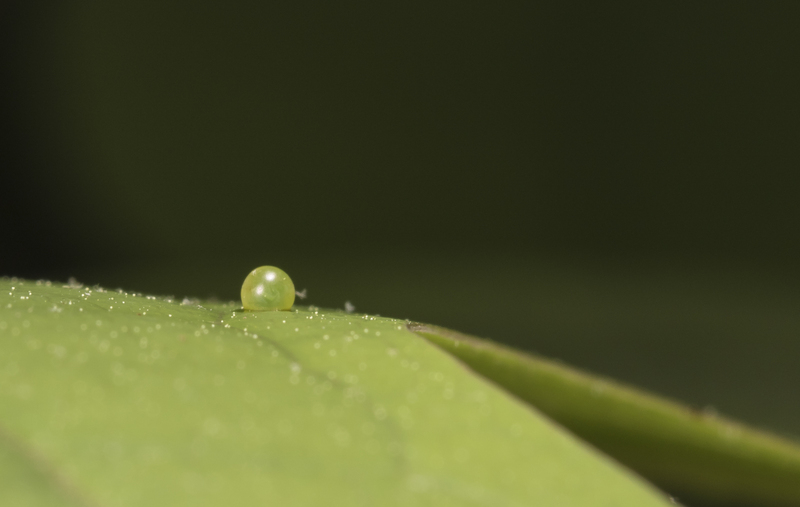 Swallowtail eggs are somewhat spherical, although the base is a bit flattened where it attaches to the leaf surface. Unlike many other butterfly eggs I have seen, swallowtail eggs lack ridges, spikes, or other sculptural elements that can give insect eggs such exquisite shapes. But, in their simplicity, they are both gorgeous and elegant. Large numbers of tiger swallowtails are flying this spring, so I would have expected to find even more eggs and larvae than we have. But, this forest is dominated by huge tulip poplars, so I imagine most of the egg-laying occurs high up in the canopy, far beyond the peering eyes of a couple of egg hunters. Over the past couple of days we did find a couple of recently hatched larvae down low, so I grabbed a few photos of these bird poop mimics. I even found a couple of leaves with real bird poop, and I couldn’t resist sharing the similarity to our little caterpillars. Curled caterpillar looking like some bird poop. 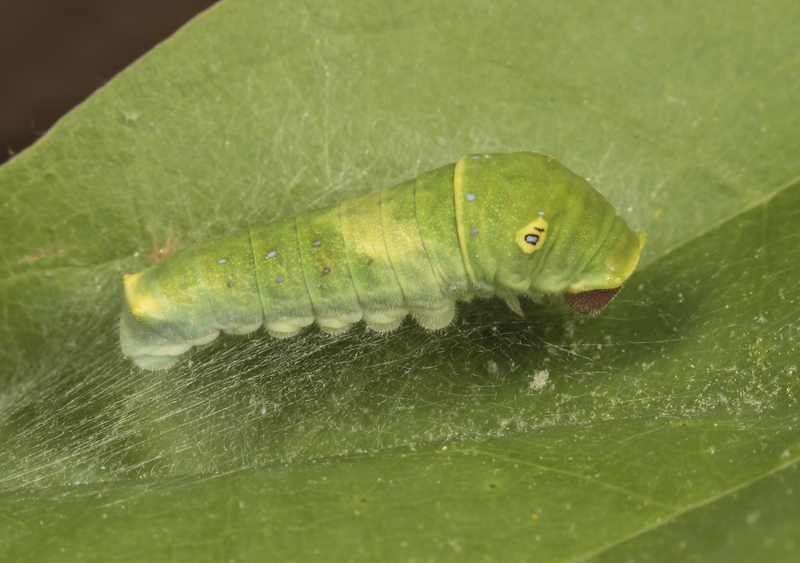 Note the silk pad the larva has created on the leaf for attachment. The combination of a dark background color with a white patch on these larvae does make for a distasteful-looking mimic. 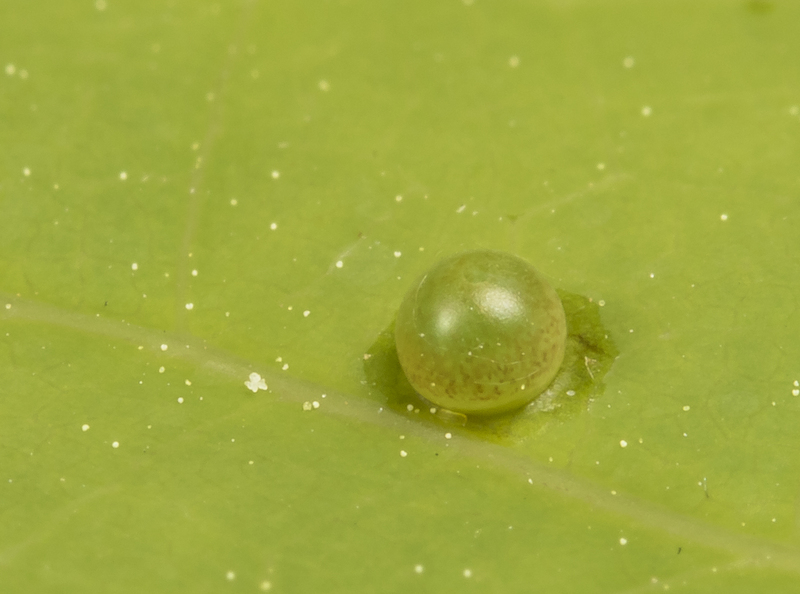 Yesterday evening, we found where one of the dark bird poop mimics had already molted into a green version, suspended above the leaf surface on their characteristic silk pad. 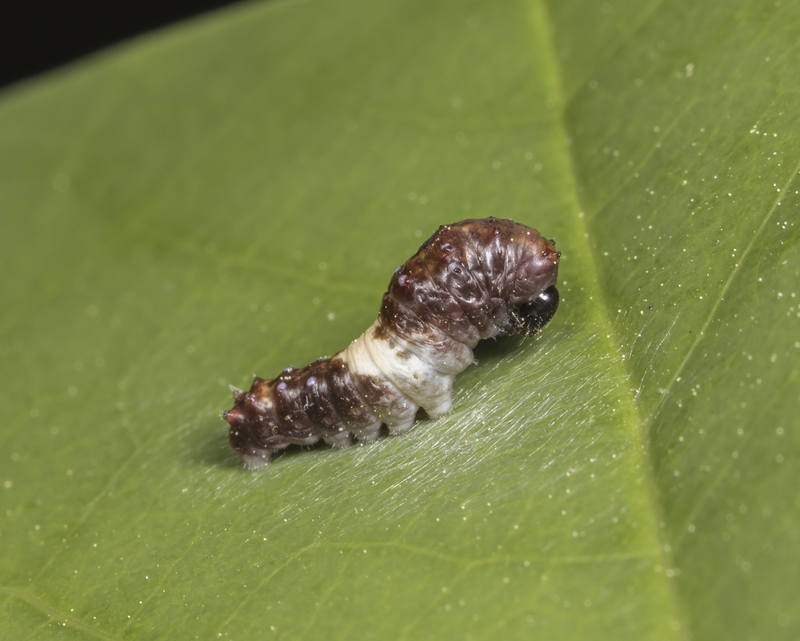 The larval stage of this species lasts about two weeks and they molt five times as they progress from newly hatched caterpillar to chrysalis. 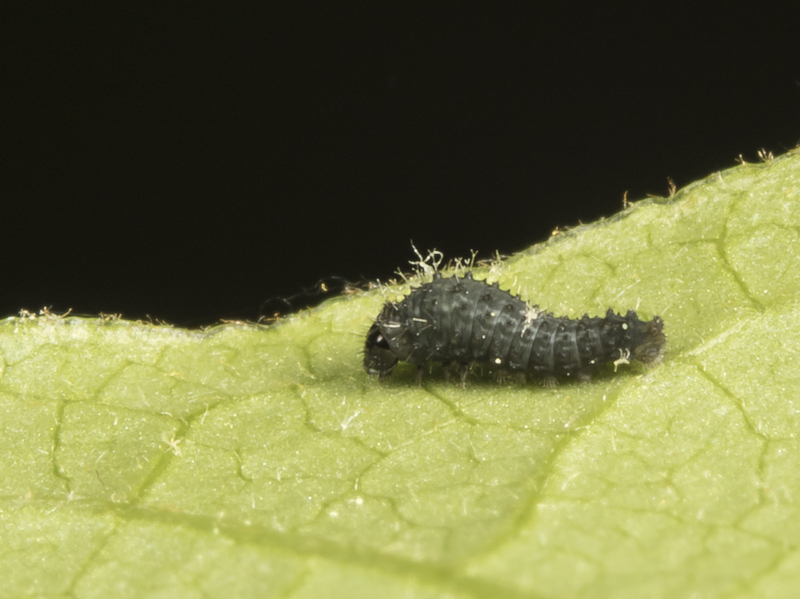 Yesterday, I again looked for the eggs and found freshly hatched larvae, the smallest ones I have ever seen. 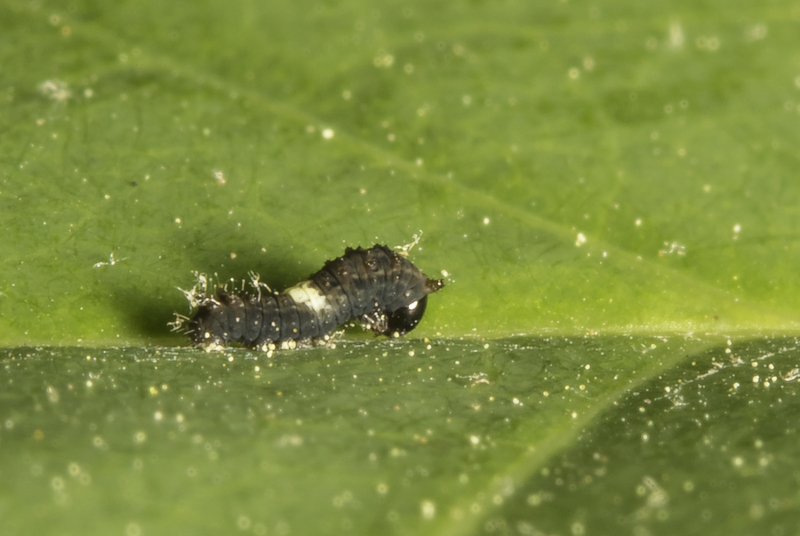 Zebra swallowtail larvae are black in the first couple of instars. 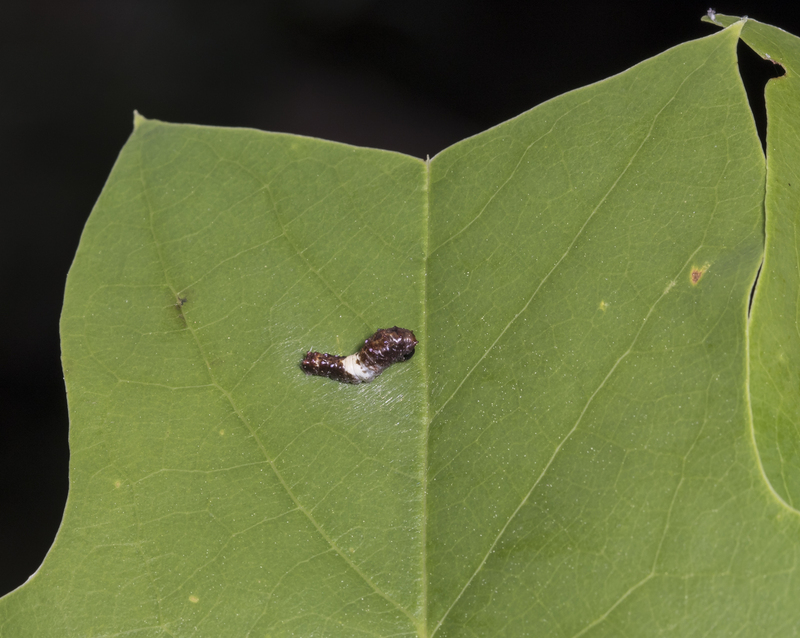 A closer view shows they lack a large white patch so common in the other larvae that mimic bird droppings. As luck would have it, while eating lunch yesterday, I saw a dark swallowtail hovering around plants, obviously looking for that special place to deposit an egg. 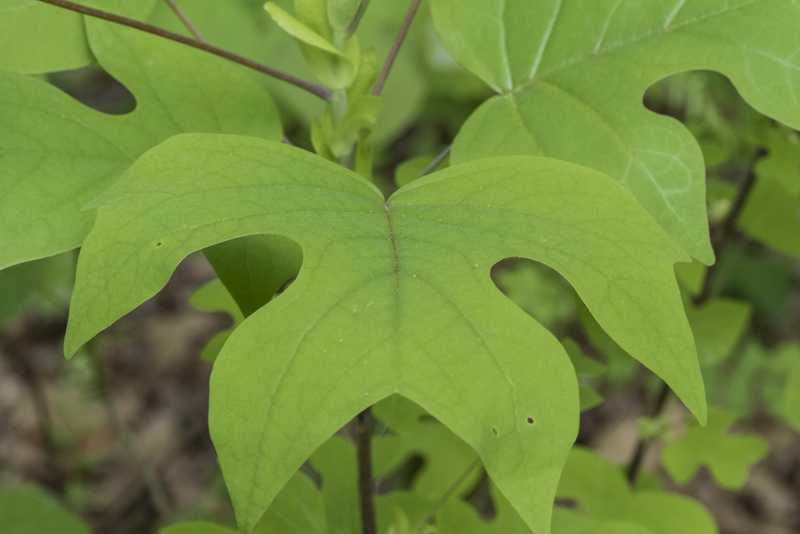 She eventually made her way to an isolated spicebush shrub, and began laying. She flitted from one leaf to another, eventually laying three eggs on that shrub, one each on the underside of three different leaves. These eggs look similar to those of the zebra swallowtail, although perhaps a tiny bit larger. I checked my parsley and fennel leaves in the garden, but no signs yet of black swallowtail eggs, so I will have to be content with three species of swallowtails for the time being. Still, this is a great start to my favorite time of the year – caterpillar season. It reminded me of a post I did last summer after finding three species of swallowtail caterpillars in one day. But I’ll keep looking at the parsley and the pipevine to see if I can break that record and maybe get to a five cat day this year. This entry was posted in Attracting Wildlife, Natural History and tagged butterfly eggs, swallowtail caterpillars by roadsendnaturalist. Bookmark the permalink. Truly incredible what you can do with camera and patience! !